The most important summer celebration in Asturias is called Piragües. Declared celebration of International Tourist Interest. The feast is attached to Sella´s river and takes place the first or second Saturday, depending if it falls on day 1 or 2. Sometimes it has also changed the date for organizing convenience, to mid-month. This event was born in the early 30s, due to canoe trips by Dionisio de la Huerta, father of the party. In Piloña and Sella rivers. In 1932 was held as a competition between both bridges from Ribadesella Arriondas.César Llano and Anton Durán, both from Ribadesella won against other paddlers from Gijón´s Regatas Club. From that year the sporting challenge was over due to the civil war. After the war the competition reached a high level of splendor, on the fifties. There a lot of Ribadesella´s athletes such as Cuesta or Chus Villar brothers became popular. From the sixties, which had already an international projection, the sports stars were playing for Spanish clubs, mainly Asturian, Aragonese - from Lugo and then British, Danish and South Africans. Since the eighties, the competition begans to be broadcast live on Spanish TV, which meant its relaunch once again. The last ribadesella´s couple that conquer the competition was composed by Alberto Llera and Monchu Cerra in 1997. Additionally to the competition, a great proportions festival takes pace. Starting the day before with a night of vigil for tourists located in Arriondas and Ribadesella. The big day begins with a parade through Arriondas town. 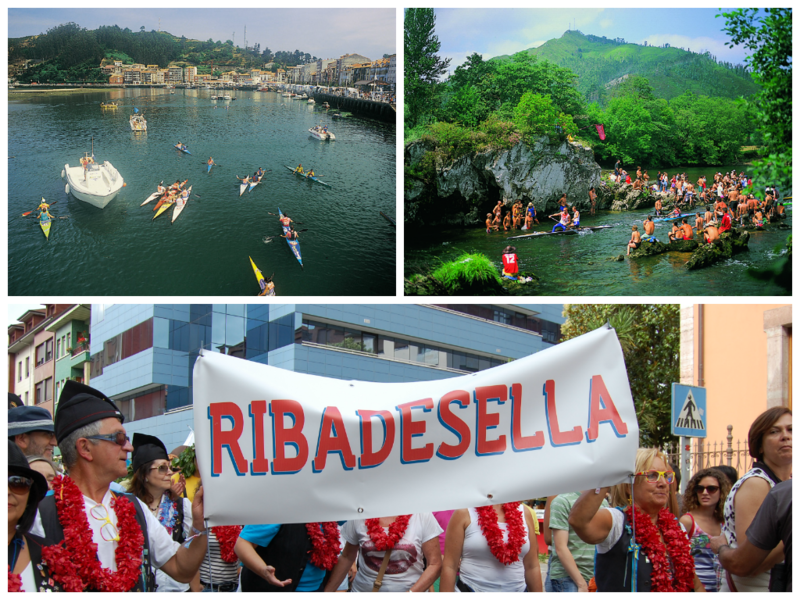 Parading the typical characters of this event, Don Pelayo, Asturian kings, giants, big heads and Tritons of Pylos, a mythical group born in the name of Dionysius imaginations to take care of the market garden, river and safety of kayakers .